Nachlaot and all of Israel is mourning HaRabbanit Bracha Kapach zts”l, who passed away this week at the age of 90. HaRabbanit Kapach was such a mighty, unstoppable one-woman chesed organization that in 1999 she won the Israel Prize for her “special contribution to the society and State of Israel.” Yehee Zeechra Baruch. In this moving video, see 5 generations celebrating completion of the entire Talmud at last year’s Siyum HaShas. Every day we recite the blessing: “May we and all our children and all our children’s children and all the children of the entire Jewish people know Your name and learn Torah for its own sake.” How moving to see this great-great grandfather, Rabbi Avraham Zuckerman zts”l, who not only said this– he LIVED it. In memory of the great Israeli singer Arik Einshtein who passed away last night at the age of 74. The headlines this morning called Einshtein the composer of “The Soundtrack of Israel.” So true…Yehee Zichro Baruch. 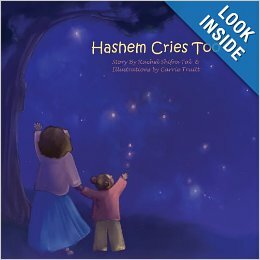 Hashem Cries Too by Rachel Shifra Tal: what a wonderful and gorgeously-illustrated book to read to young children during the confusing and painful aftermath of a miscarriage or stillbirth. Highly recommended.